Dr. Seuss Day, March 2, is quickly approaching and what better way to celebrate than crocheting up a couple of Dr. Seuss inspired bookmarks. 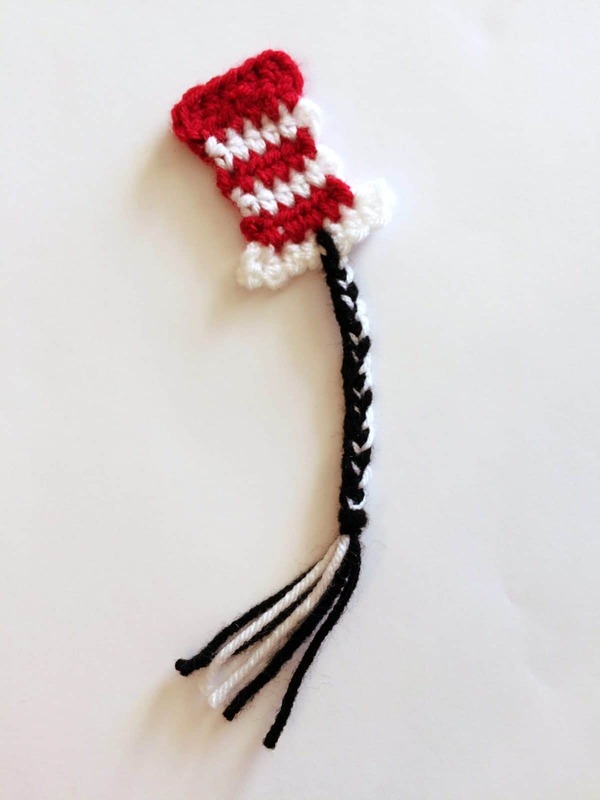 This Cat in the Hat Bookmark is perfect for your favorite readers! This is such a fun and easy way to pay homage to one of the best children’s authors. We got to enjoy marking our places in the different Dr. Seuss books we enjoy reading with our Cat in the Hat bookmarks. I love that this is bookmark my littles can’t destroy easily either! Small amounts of red, white and black worsted weight yarn. I used Hobby Lobby’s I Love This Yarn! To change colors seamlessly at the end of each row, begin your hdc stitch normally by yarning over, insert hook in stitch then drop the first color, pick up the next color and pull up and through to finish your stitch. Carry the last color yarn with you across the row and pick it up again at the end when it’s time to change colors. Join my email list below to receive access to all the freebies in my Resource Library! Sign me up for ChristaCoDesign’s Newsletter! Look only one end to weave in, even with all those color changes! Cut three lengths of yarn (mine were about 12″) in white and black (I chose 2 black, 1 white). Use your yarn needle to insert them into the center stitch of your first row (the brim). Braid and knot the yarn tail. Trim ends to desired length. Celebrate with your little readers and your Dr. Seuss inspired bookmark! This worked up so quick and easy! I’ve already made three for my boys. I think little sister needs one too! Happy Dr. Seuss Day! I hope your day is filled with lots of reading and crocheting! Click the box above to join my email list & learn about free patterns weekly, monthly giveaways and gain access to my Resource Library!